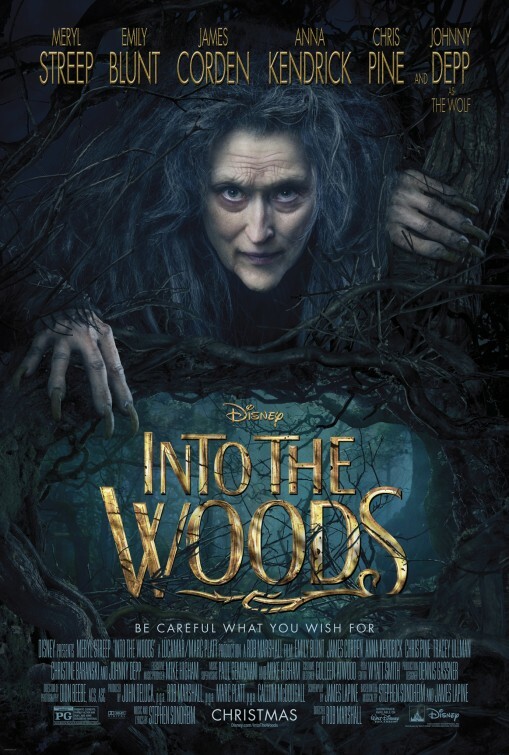 The original stage version of Stephen Sondheim’s musical Into The Woods is a fairy tale not necessarily for children – its complex adult themes range from poverty, adultery and even paedophilia (yes, really; but more on that later), all mixed with the composer’s trademark bouncy and lively lyrics and score. With that in mind, Disney was never going to be the right studio to be behind this long-mooted adaptation, the development of which spans back to the 80s when the likes of Billy Crystal and Meg Ryan were courted for roles. For what it is, however, you may be surprised by how closely the final film sticks to its original roots… with a few noticeable polishes by the House of Mouse, of course. 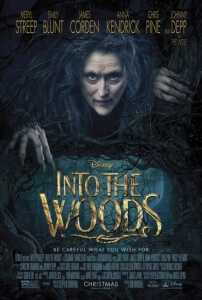 Aside from the slight altering of selected plotlines and certain characters’ respective fates, Into The Woods is a strangely faithful adaptation that stays true to its underlying message and questionable character motivations. Sondheim’s songs are still as vibrant and electrifying as ever, and are sung with true passion and careful treading by its performers – after all, these are some very complicated lyrics to memorise let alone rehearse, especially as they overlap constantly. They range from poignant and heartfelt – showstopper “Stay with Me”, sung by Meryl Streep’s Witch, is a powerful ditty about love and protection – to satirical and downright hilarious – “Agony” as performed by Chris Pine and Billy Magnussen’s Princes perfectly parodies the over-the-top and melancholic nature of fairy tale princes mourning for their missing loves – without ever stopping to breathe. In some senses, that can be a small problem; because there are so many tunes to croon in such a short amount of time, the way they are all crammed in can make it a slightly exhausting experience to watch, but these numbers in particular are so cunningly crafted that you’re having just as much fun watching them sing these difficult verses to the best of their abilities. What may be the most surprising thing they kept in the entire film, aside from its overall dark elements lifted straight from the original Grimm Brothers stories as well as its sombre and dramatic third act, is that underlying paedophilia theme. These come in the earlier scenes involving Lilla Crawford’s Red Riding Hood and Johnny Depp’s Tex Avery-esque zoot-suit wearing Wolf, the latter of whom takes an interest in the young girl with the idea to eat her whole as in the original fairy tale. In the musical, however, the Wolf’s motivations deliberately come across as, erm, more perverse than usual, thus introducing some extremely uncomfortable undertones in the ensuing song (and, heck, even its title) “Hello, Little Girl”. It’s shocking that it is kept in the film for a number of reasons, the prime one being that it’s produced by Disney; the juxtaposition of the theme and the studio couldn’t be more obvious if it tried. Of course, it’s never stated that the Wolf’s interest is indeed more than just eating her whole as per tradition, but even so for Disney to allow this sort of subtext to exist freely in one of their films is a surreal yet ballsy decision that may signpost how adult they can sometimes be, even when aiming their material at family audiences. Director Rob Marshall is no stranger to directing musical adaptations, from the Oscar-winning Chicago to the not-Oscar-winning Nine (if you even remember that film, kudos to you), but Into The Woods provides him with his most risky film to date in terms of its themes, criss-cross matching with all these different fairy tale characters coupled with original ones, and its potential audience. His direction is fine here, though more attention is wisely given to the lavish production design and costumes, which are decidedly theatrical and even subtle (yes, subtlety in a fairy tale, that’s SO rare…). The action is mostly confined to the titular location so must make good use of its environment and atmosphere, which it manages to do rather well. As for the performers, there is certainly passion within their souls as they endlessly sing Sondheim’s lyrics. Streep looks like she’s having the time of her life (or at least she looks like she does; she’s not a three-time Oscar-winner for nothing) as the Witch, somehow providing gravitas and depth to an otherwise pantomime performance; Emily Blunt channels her inner-comic with a lively and spirited turn as the wife of James Corden’s Baker; Corden, incidentally, has a fine on-screen presence and offers a hint of something much deeper and emotional than we previously expected from the Gavin and Stacey star; Anna Kendrick simply does her thing to pleasing effect, while Pine surprises with a funny and heartfelt “jerk” role; the two younger stars Lilla Crawford and Les Miserables’ Daniel Huttlestone have fine young voices and charming personas as Red Riding Hood and beanstalk-climber Jack respectively; and those itching to see Johnny Depp do something other than play make-believe with make-up will be disappointed with what is essentially an extended cameo as said Wolf.